When it comes to engine cooling, the radiator is kind of a showoff. It sits right up front, catching the best breeze, dominating the conversation. And when it erupts in a cloud of coolant and steam, everyone knows about it. However, the engine valves (particularly the exhaust valves) shouldn’t be overlooked for the role they play in keeping an engine cool. The exhaust valves take 75 percent of the heat from the combustion chamber and the valve seats have the responsibility of helping to cool them off by drawing heat away from the valves and conducting it into the cylinder head. – it must support and seal the valve when the valve closes, it must cool the valve, and it must resist wear and recession. Consequently, a performance valve seat material should provide a certain amount of dampening to help cushion the valve when it closes at high rpm. Very hard materials, especially on the intake side, are not the best choice because intake valves tend to be larger, heavier and close at faster rates than exhaust valves. Seats are under tremendous stress, which manifests itself in three different ways. • Impact Stress is the force of the valve striking the seat as it opens and closes. The wilder the cam profile, the more pounding the valve and seat undergo at high rpm. Seats are available in a range of materials ranging from nodular/ductile iron alloys and powder metal steel seats to hard aluminum-copper and bronze alloys and beryllium copper alloys. Many valve seat suppliers have their own proprietary alloys while others use industry standard alloys. As a rule, most experts recommend replacing OEM valve seats with ones that are of a similar material, except in cases where extra durability is required because of a change in fuels (converting to propane or natural gas, for example), or an engine is being built for racing. Increasingly, that means using powder metal seats. Nearly all late-model domestic and import engines (perhaps 90 percent or more) come from the vehicle manufacturer with seats made of powder metal. These types of seats are very hard and durable, so they typically show little wear at high mileages. Consequently, the seats may need little work when the cylinder head is rebuilt. A key difference between seat types is the production process. Cast alloy seats are made by melting and mixing different metals together so they combine chemically. The molten material is then poured into a mold and cast to shape then allowed to cool. The rate of cooling and subsequent heat treatment of the metal determines its microstructure, hardness, strength and other physical properties. Powder metal seats, by comparison, are made by mixing together precise amounts of various dry metal powders (iron, tungsten carbide, molybdenum, chromium, vanadium, nickel, manganese, silicon, copper, etc. ), forcing the mixed powders though a series of dies that compact the powder under intense pressure (100 tons, in some cases) into a near net shape. The “green state” seats are very fragile and can be easily broken. The sintering process then causes the powders to bond together and form a solid composite matrix with very uniform and consistent properties. It’s important to remember that “powder metal” is a process, not a product. There is no standard “recipe” for powder metal components; instead, each blend is designed for specific applications. It’s important to remember that “powder metal” is a process, not a product. 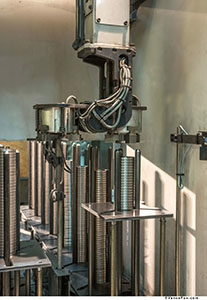 There is no standard “recipe” for powder metal components; instead, each blend is designed for specific applications. 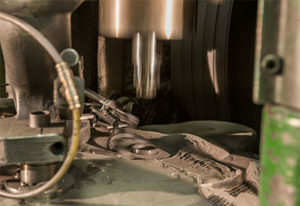 Photo courtesy Dura-Bond Bearing Co.
One of the advantages of powder metal sintering is that materials that are difficult or impossible to mix together in a molten state can be blended together and bonded to create totally unique materials. It also provides great structural integrity. The internal molecular consistency of a cast part tends to be less uniform. 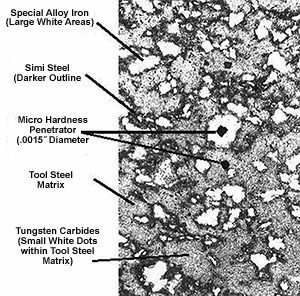 Voids and irregular, sometimes uneven, distribution of alloys can occur. Another advantage of the powder metal process is that parts can be manufactured very close to final tolerances, reducing the amount of machining needed to finish the part to size. Runout on a cast seat is typically seen at 0.003˝ to 0.005˝; on a powder metal seat it is about 0.001˝. And, at a microscopic level, cast seats can have a rougher surface, which increases friction and accelerates wear. Powder metal seats typically have a smoother surface, requiring less machining effort. Vehicle manufacturers didn’t just switch from cast alloy seats to powder metal seat inserts because they care about easing your machining effort, of course. The primary driver is to extend durability and to meet emissions certifications of 150,000 miles or more depending on the application and model year. Powder metal valve seats can be “hard” yet machine just like cast iron (Illustration courtesy of Dura-Bond Bearing Co.). miles of use. The homogeneous consistency of a powder metal seat also improves heat transfer, which is good for the valves, too. Powder metal seats also tend to experience less micro-welding between the seat and valve even at high combustion temperatures, which helps extend the life of both components. The seat alloy and hardness must also be matched to the type of fuel used and the engine application and compatible with the type of valves that are installed in the engine. Again, there are often differences of opinion regarding the selection and use of various seat materials. It’s more noticeable in performance engines. Titanium valves do not shed heat as quickly as stainless steel valves, so the tradeoff for switching from steel to titanium to save weight is often hotter running valves. The higher the temperature of the exhaust valve, the greater the risk of the valve causing a preignition or detonation problem. There is also increased risk of the valve burning. That’s why many suppliers of titanium valves recommend seat materials such as beryllium copper. Some of the more recognizable engines with head issues have been the GM LS3 engine as well as BMW and Mercedes and the Chrysler 3.7L, 4.7L, 5.7L and 6.1L engines. Copper-infiltrated seats are used at the OE level and are available in the aftermarket as well. For racing applications using either stainless steel or titanium exhaust valves, some suppliers recommend a sintered valve seat insert, which includes a blend of finely dispersed tungsten carbide in a matrix of tempered M22 tool steel and special alloy iron particles. These powder metal seats have a very uniform microstructure, and are highly machinable. Because powder metal seats harden as they age, they don’t have to be as hard initially to provide good long term durability, and the self-lubricating qualities of the material allows it to handle a wide variety of fuels, including unleaded and leaded gasoline, straight alcohol, nitrous oxide and nitro methane. A shot of nitrous will cause combustion temperatures to soar, but the dose usually doesn’t last long enough to have any detrimental affect on the seats. The next step up is a high alloy seat material, for applications where high heat resistance is required, such as a propane or natural gas fired stationary engine but also for high performance engines, heavy-duty and extreme duty engines where longevity is a must. Seats are made out of high-speed tungsten carbide tool steel, which gives it ceramic-like characteristics for extreme temperature resistance. Conversely, because they tend to run much cooler than exhaust valves, low alloy seats work well with intake valves in performance applications, even in such extreme cases as offshore racing boats that run for hours on end. Anything that interferes with a seat’s ability to cool the valves (such as a loose fit, poor surface finish or deposits between the seat and its counterbore) can lead to premature valve failure and expensive comebacks, so a cylinder head job often requires valve guide and seat work to restore it for service or to improve performance. 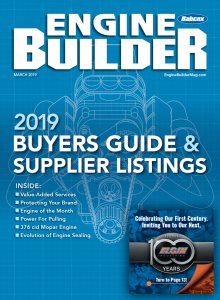 In order for a valve to seat correctly, for efficiency and power, engine builders must replace or bring back to spec all valve seats and guides. When considering the steps necessary to repair or replace valve seats, be aware that with two types of cylinder heads you have three options: aluminum with removable valve seats or cast iron, with removable or integral hardened seats. If the cast iron head has integral seats it will need to be machined to replace the seat. If the head is aluminum, the seat counterbore may have to be machined to accept an oversize seat if the bore is loose, deformed or damaged. Either way, you’ll need to figure the amount of interference that is required for the new seat before cutting the head on a seat-and-guide machine. This CNC machine cuts the inside diameter seat detail. Photo courtesy Dura-Bond Bearing Co. Valve seat replacement is required if the cylinder head was warped and needed to be straightened before resurfacing. Similarly, if an aluminum head was cleaned by heating; if the valve’s mating surface has receded below factory specifications; or if machining the head would cause the seat to fall below factory specs, the seat must be replaced. Integral seats in a cast iron head should be replaced if the head has been ground before, because the hardened depth of the head used in the seat area will be too shallow to allow a second grinding. 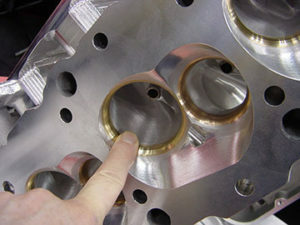 If the valve seat insert shows evidence of being loose or doesn’t have adequate interference; if there is evidence of corrosion on the cylinder head around the outside diameter of the valve seat; or if there is evidence that the seat has any cracking, burning, pitting or fissures, the seats must be replaced. Nonintegral valve seats can fail for a number of reasons, especially when they show signs of being cracked or are too worn to be reground or remachined. Seats can crack from any of the stresses listed earlier. Another cause of seat damage is valve recession, which takes place when the seats get hot and microscopic welds form between the valve face and seat. A small amount of recession results from normal high mileage wear, but it can also occur when unleaded gasoline or a fuel such as propane or natural gas is used in an engine without hardened seats. Every time the valve opens, tiny chunks of metal are torn away and blown out the exhaust. Over time, the seat is gradually eaten away and the valve slowly sinks deeper and deeper into the head. Eventually the lash in the valvetrain closes up and prevents the valve from seating. This causes the valve to overheat and burn. Misdiagnosis of the lost compression may lead you to believe the engine has a bad valve – in reality, improper valve seat selection and installation may have been the underlying cause of the failure, and the time bomb may have started ticking thousands of miles earlier.